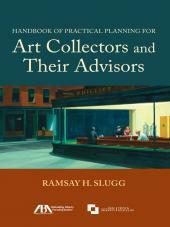 This book introduces and explains a client-focused process to use when advising art collectors. After a brief discussion of the art market generally, the book introduces and explains a client-focused process to use when advising art collectors. This process includes explaining both the income, estate and gift tax consequences of various options, as well as the important and often emotional non-tax considerations of collecting and disposing of art. The book also discusses the role and importance of other advisors who are involved in these decisions, including art advisors, risk management professionals and appraisers. To better illustrate the material, the book features enlightening case studies.